Sauder 404944 Heritage Hill Computer Credenza, L: 59.13"
Enhance your office workspace with this computer credenza from the Heritage Hill collection. Its spacious tabletop provides you with room for all your office essentials – laptop, tablet, paper and pens! Its slide-out laptop/keyboard drawer has a flip-down front and features full extensions slides and a power strip with three outlets for convenient charging and electrical access for your office gadgets. Other features include a small easy gliding storage drawer, a lower drawer that accommodates letter, legal, or European size hanging files, a storage area behind the door to hole a vertical CPU tower, and a grommet hold for cord access. 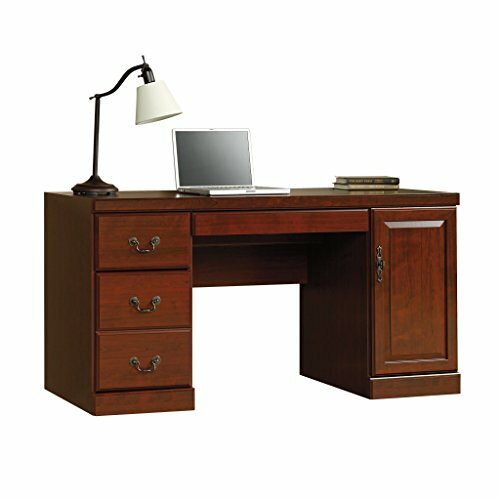 Finished in Classic Cherry, this handsome desk will bring your home office to life. 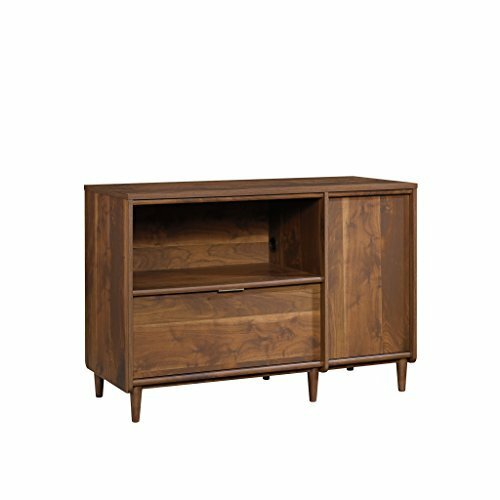 Bring a touch of elegant, mid-century inspired style to your home with this credenza from the Clifford Place collection. This beautiful credenza offers a spacious tabletop surface that provides you with room to display a stylish accent lamp, a decorative clock, and photos of family and friends. Switch it up and use as a TV stand! It accommodates up to a 46" TV, making it perfect for binge watching all your favorite shows. Its large open shelf provides you with the ideal amount of space to store and display movies, books, bins, and other home décor. 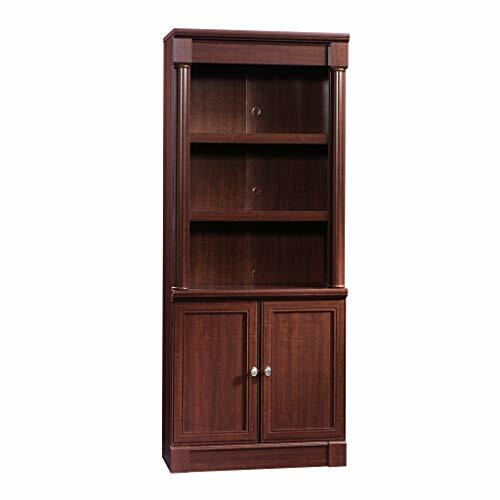 Behind the door is hidden storage that includes an adjustable shelf for all your additional storage needs. The lower file drawer opens and closes on smooth full extension slides and holds letter or legal size hanging files so you'll always be organized! It also features cord pass-throughs to keep all your wires neat and out of the way. Finished on all sides in Grand Walnut and accented with solid wood feet and bold brass hardware, this stylish credenza will stand out in any room. Tired of your living room looking boring and bland? Add some style with this credenza from the Barrister Lane collection. It accommodates up to an 80" TV, making it perfect for entertaining family and friends. It features framed glass doors, two adjustable shelves, and an enclosed back panel with cord access. Finished in an eye pleasing Salt Oak, this stand can turn any room from drab to fab. Sure, lots of office and home furnishing manufacturers can help you create an organized, comfortable and fashionable place to live. But Sauder provides a special kind of furniture that is practical and affordable, as well as attractive and enduring. As North America's leading producer of ready-to-assemble furniture, we offer more than 500 items that have won national design awards and generated thousands of letters of gratitude from satisfied consumers.As fashionable as it is functional, this credenza from the Harvey Park collection is a compliment to any room in your home. It accommodates up to a 70" TV, making it ideal for entertaining friends and family or watching your fave movie on the big screen. It features three open shelves along with three storage drawers that open and close on smooth metal runners. 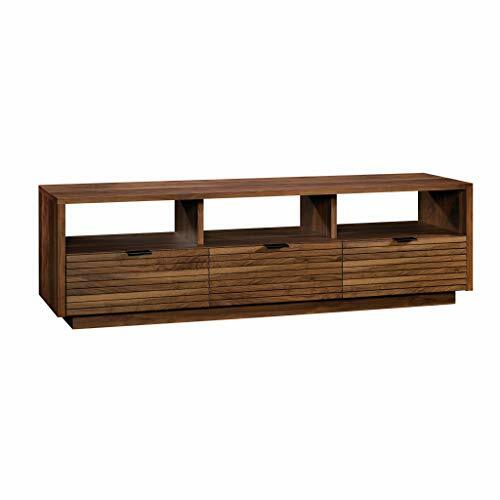 Finish in Grand Walnut, this chic TV stand will be the center of attention in your living room. 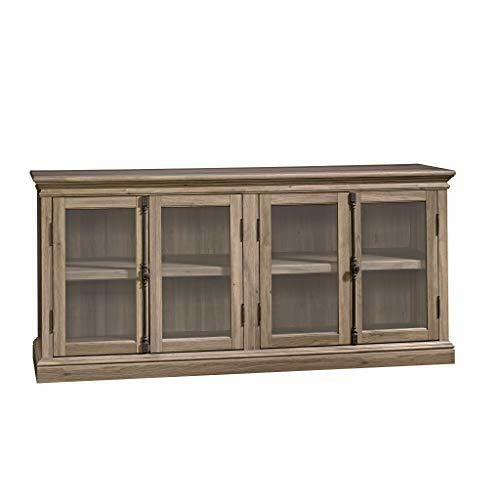 Sauder 412019 Palladia Library with Doors, L: 29.37"
Storage that makes a statement – that is what you will get with this beautiful library with doors from the Palladia collection. It features two spacious shelves that are ideal for storing and displaying all your miscellaneous home essentials – your collectables, decorative knick-knacks, your most prized possessions and photos of your family. It has room for all your stuff! Its two adjustable shelves have the ability to move to different heights to create flexible storage options for items of all different shapes and sizes. Behind its double doors is a hidden storage area that includes a large adjustable shelf for you to store and conceal all your clutter and chaos. It also includes cord access through the enclosed back panel so you can keep all your wires organized and out of the way. It's detailed with framed panel doors and nickel hardware to give it an extra touch a classic beauty. 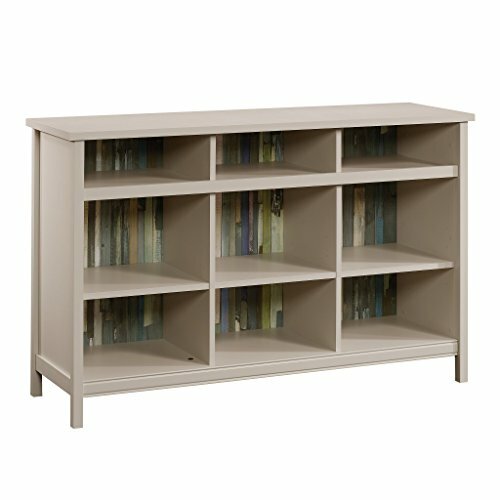 Finished in Select Cherry, this stunning library makes a great addition to any room in your home. Beautify your home office or workspace with the simple elegance of this computer credenza from the Office Port collection. Its durable, melamine tabletop provides you with plenty of space for you and all your office essentials and is resistant to heat, stains, and scratches so it will hold up no matter what project or job you are working on. It features a slide-out keyboard/mouse shelf and two small storage drawers that open and close on smooth metal runners. Its large lower drawer includes full extension slides to accommodate letter, legal or European size hanging files so you can keep all your important files and papers organized! Behind the door is a hidden storage area with an adjustable shelf, but can also hold a vertical CPU tower. It also includes a grommet hole to easily run your cords and wires through. 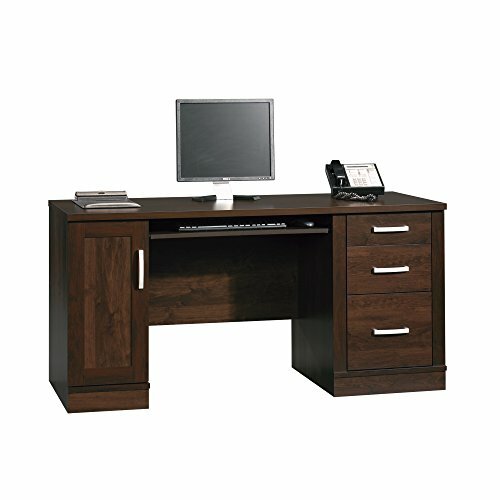 Finished in an eye pleasing Dark Alder, this handsome desk will have you feeling motivated and ready to work. Living room looking bland? Spice it up with this entertainment credenza from the Barrister Lane collection. It accommodates up to a 60" TV, making it perfect for entertaining all your friends and family. Behind the framed, safety-tempered glass doors is a large adjustable shelf to hold video and gaming equipment. It also features two small adjustable shelves for additional storage and display. Finished in Salt Oak, this TV stand will be the center of attention in any room. Give your office or workspace a little extra style and a whole lot of extra storage with this hutch from the Office Port collection. This handy hutch features two framed, safety-tempered glass doors that flip up and lock in position. These storage compartments make the perfect place to not only store books and other office supplies, but also to display home décor and your prized possessions. Also, behind each door is a display light so you can illuminate and show off all your belongings. It also features cubbyhole storage that includes two adjustable, safety-tempered glass shelves for additional storage and display. 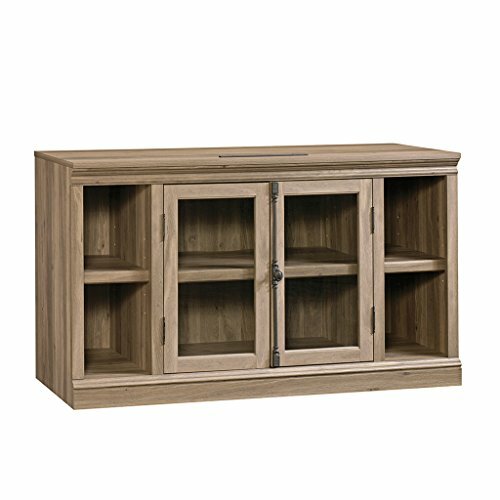 This handsome hutch attaches to Computer Credenza 408291 to give your office a completed look. 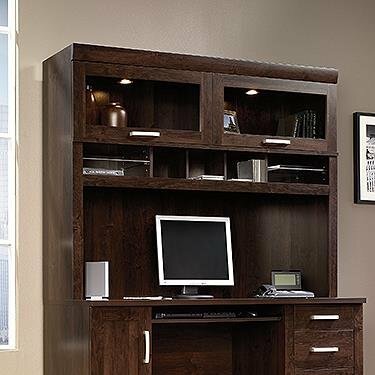 Finished in a stunning Dark Alder, this hutch adds elegant style and functionality to your office. 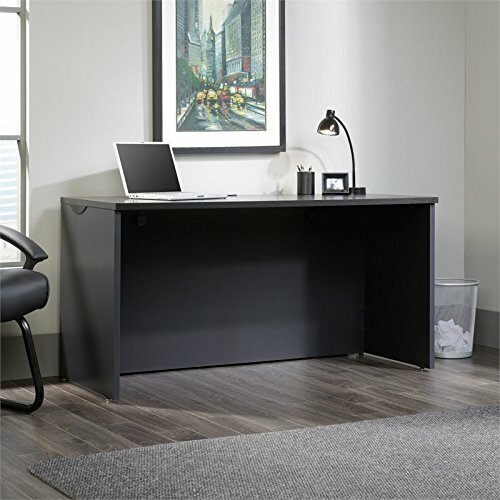 Compare prices on Credenza Sauder Office Furniture at Elevelist.com – use promo codes and coupons for best offers and deals. We work hard to get you amazing deals and collect all avail hot offers online and represent it in one place for the customers. Now our visitors can leverage benefits of big brands and heavy discounts available for that day and for famous brands.